Emperor Charles V's pavilion at the Alcazar Gardens in Sevile, Spain. A demonstration of the beauty of cuenca seca tiles and their popularity among the elite. 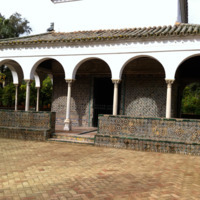 TravelGenee.com, “Charles V's Pavilion in Cuenca Seca Tile,” Medieval London, accessed April 22, 2019, http://medievallondon.ace.fordham.edu/items/show/116.